Quality private hideout equipped with 2 paddle boards and 2 kayaks! Play Like a Pirate. Fully equipped. 78' houseboat Located in Key West Inn and Marina. In the heart of Key Largo you will be close to shopping and nightlife.. Queen size bed in back Master Suite and one Queen size in the other bedroom, two queens in Bunkhouse, also full kitchen with all appliances. Facilities include pool, and ice machine at hotel. The boat does not leave the dock. There is not docking for another boat on/next to the houseboat. The shower is shared and between the bathrooms. Large washer at the hotel's guest laundry also available. The dryer at the hotel for guests dries much quicker! The houseboat stays at the dock. Exactly as pictures and write-up described. Perfect setting for sitting on the deck watching the boats go by. Beds were comfortable, living areas spacious, great location with easy parking. We would rent this property again. Thank you. Hope to see you next year! Clean, convenient, great location! Loved our stay. Boat was a nice change!! We'll maintained, good location with use of a nice pool. Will do this again some day. We loved this house boat! It's such a unique experience and was really an unforgettable vacation. Marie the host is great at her job. There were wonderful touches, including fresh-cut flowers in the kitchen and complementary bottles of wine. The house boat itself was very roomy and didn't feel cramped at all. The TV is a smart TV that had a Pandora app installed, so we listened to a lot of music. The wi-fi worked fine. I can't think of a single negative thing about the experience. We would love to come back! I do not know how to describe how much we loved this houseboat vacation. 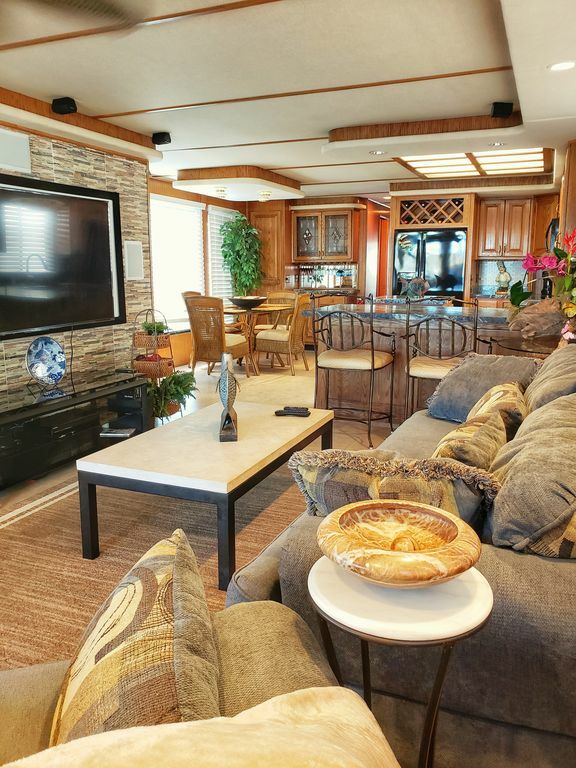 The houseboat is upscale and spacious. Everything we could think of was provided. The property is spotless. The location is perfect. All the activity in the marina passes by the house boat for your entertainment. Happy hours, restaurants and beautiful sunsets are a short easy walk. Manager is relaxed and efficient ensuring you have a perfect stay. Our stay was too short we must go back. It was a pleasure having you all stay. Look forward to your next visit! Waiver of Liability form to be signed by all guests at booking. Rates subject to change prior to booking.